This past Sunday I ran the Goodwater Loop Trail which circumnavigates Lake Georgetown. 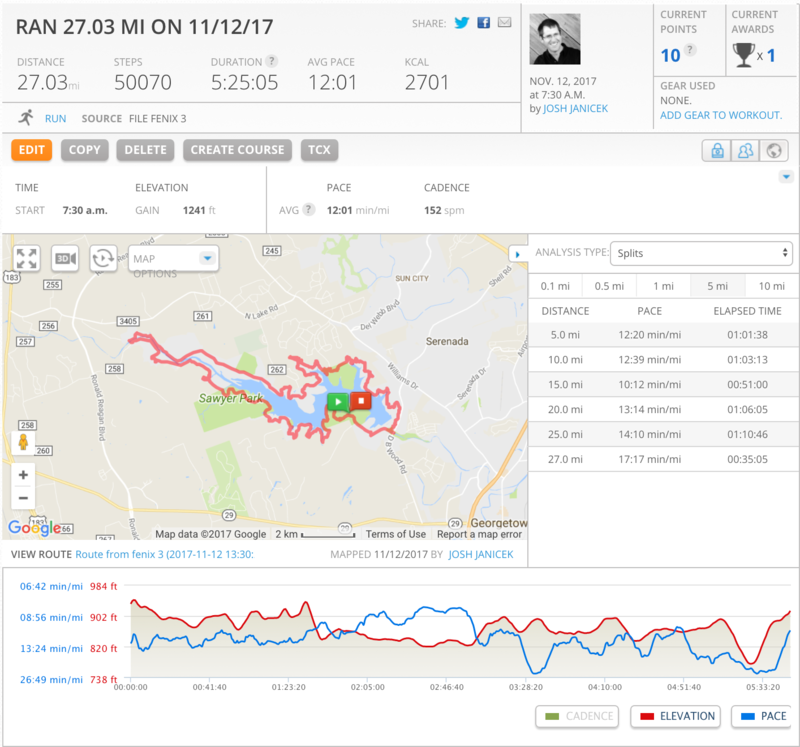 My training plan called for a 26 mile run, and the Goodwater Loop is 26 miles, so I figured that’d make for a good training run. The latter part of my training plan switches from distance-based runs to time-based runs, meaning instead of dictating that I run for 20 miles, I instead run for 3 hours, regardless of distance. This strategy is to just get me acclimated to being on my feet for long periods of time. My longest (time-based) run is 5 hours. It took me 5 hours and 25 minutes to make the loop. The trail was a lot more technical and difficult than I’d anticipated. There wasn’t a lot in terms of elevation gain, but the trail itself is fairly technical and had its share of roots and rocks. The trail itself is quite pretty, and about the time I’d get bored with the scenery and landscape, it would change like a channel on the TV. I’d be running in open grassland on a dirt trail for some miles, and then before I knew it, I’d be running under oaks and cedars navigating through sharp granite and cedar roots. And then I’d find myself running with the blueish green lake to my right atop solid granite rock. There are lots of historic markers along the trail that I admittedly neglected to take in and observe, only for the fact that I was there to run and not hike & site see. A few miles into the trail from Cedar Breaks is the Crocket Garden and Falls. I heard the falls, and I stopped to try to take a peek, but it was really wet out, I didn’t know where I was, so I just decided that I’d observe by ear and maybe come back one day to actually see the falls. I got to the Cedar Breaks trailhead right at 7:30 a.m. and it was drizzling. The drizzle and dew on the ground made for really wet shoes and socks by around mile 5. I was really nervous that I’d have hot spots or, worse, blisters with 21 more miles to go. Thankfully my socks dried out in time while running through landscapes that weren’t grassland until the next section of wet grassland. The trail was lonely and isolated at most points. I only saw 4 people until I got closer to Cedar Breaks and the day had kind of cleared up. Many parts of the trail are too technical to be runnable. I ran out of food and water around mile 23, and got pretty nauseous around mile 24. I had to hump it at mile 25-something and decided to run past my starting point at Cedar Breaks to cover 27-miles. It was a tough run, and I annihilated a Whataburger combo meal as soon as I got back to the Jeep. A couple days later and my calves are still pretty shredded, and my chest, mid-back and gastro-intestinal track seem to be having the hardest time recovering.